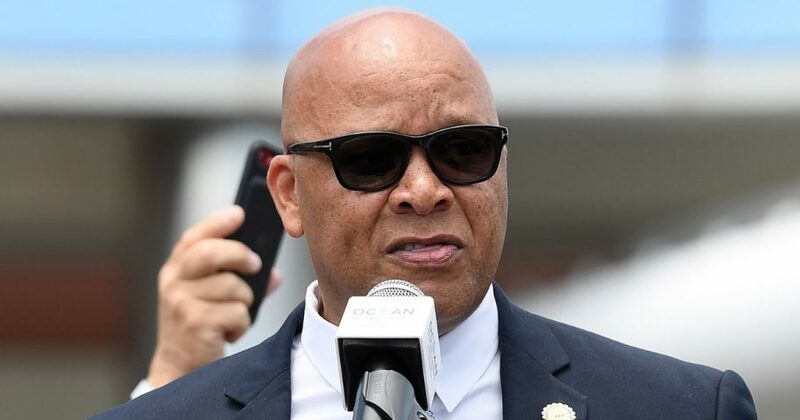 FBI agents raided the home of Atlantic City, New Jersey, Democrat Mayor Frank Gilliam on Monday morning. NJ.com reported that about 12:30 p.m., Gilliam and his wife emerged from the home and drove away without making comment to reporters. Do you think Gilliam should be forced to step down? Gilliam, dressed in a gray suit, pursues an identified man wearing a white t-shirt. Fauntleroy, wearing black pants and a dark jacket, then tosses a man to the ground. The mayor allegedly threw punches at two people, while Fauntleroy punched one person in the face multiple times. ABC News reported that prosecutors have said they will not pursue felony criminal charges, but the case was sent to municipal court where Gilliam will face simple assault and harassment offenses. According to NJ.com, the Atlantic City Democratic Committee voted 27-3 last week on a resolution calling on Gilliam and Fauntleroy to leave their positions, while an investigation is conducted. The resolution asks Gov. Phil Murphy and Lt. Governor Sheila Oliver to exercise their authority to temporarily suspend and remove both city officials until the legal process is resolved.